Animal rights groups on Monday called for measures to reform the livestock industry, saying that factory farming is behind the egg contamination scandal. The pesticide-tainted egg crisis is only a prelude to bigger threats to the food safety and public health unless the practice of cramming chickens into battery cages to maximize profits is stopped, they said. 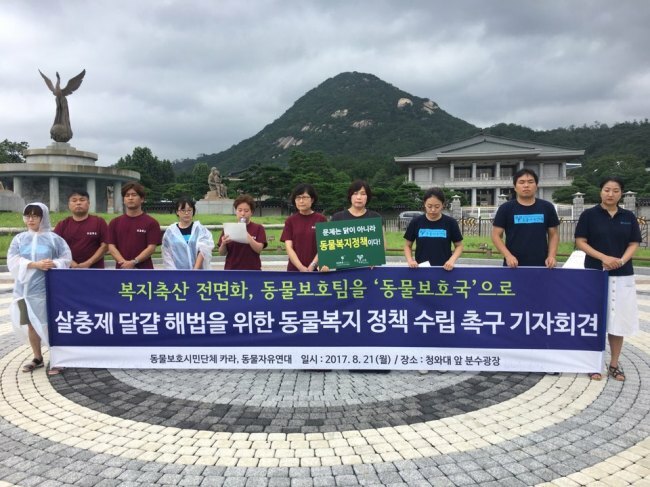 “It is a consequence of industrialized livestock production and it poses a threat to our food security,” said Jeon Jin-kyung, executive director at Korea Animal Rights Advocates, during a press briefing. President Moon Jae-in promised to overhaul the industrial livestock production, but the question is how he will specifically do so,” she said, criticizing the past governments’ lukewarm efforts to tackle the “fundamental” problem. The calls come amid growing fears over the distribution of eggs contaminated with insecticides, which experts say could harm human kidneys and liver if consumed in large quantities. So far, the 52 poultry farms have been revealed to have sold eggs tainted with high levels of insecticides. The farms had used eight kinds of pesticides including fipronil and flufenoxuron, which are used to kill fleas, lice and ticks on animals, according to the government’s inspection. About 1370 farms, or 94 percent of the poultry farms in the country, use battery cages that severely restrict animals’ movements and pose hygiene issues, according to government data. The floor area of a cage for each bird is about the size of a sheet of A4 paper. South Korea is not alone. Eggs containing insecticide fipronil were found in the food chain in 16 European countries and Hong Kong in August, according to the European Commission. The animal rights activists highlighted that the egg scare could have been prevented if chickens had been able to freely move around and remove ticks by cleaning themselves with sand and soil. “As five to six chickens are locked in a battery cage, their immune system weakens and diseases spread in no time. As there are no ways to get rid of ticks, farmers cannot help but spray insecticides. 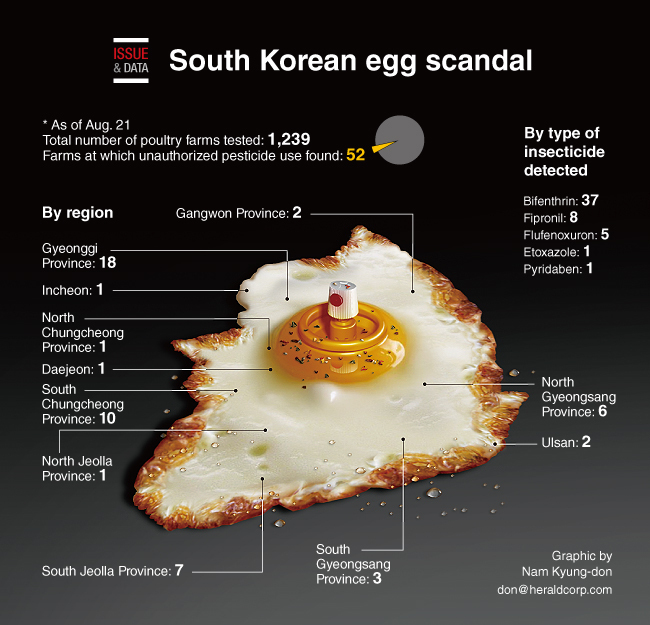 In such an environment, the tainted egg crisis and the outbreak of bird flu is just a natural consequence,” activists said. Intensive farming is also to blame for the outbreak and spread of the bird flu virus, they said. Until April, nearly 40 million poultry were culled due to bird flu, which was first reported in November last year. When bird flu infects a single bird on a chicken farm, the whole population is destroyed to stop the spread. The government said it would tighten regulations on the use of insecticides and ensure codes are printed on eggshells to inform consumers of when and who produced the eggs. In the long term, it will expand a system to certify eco-friendly farms with high animal welfare standards, it said. But animal welfare groups said it is not possible under the current system that lacks a comprehensive animal welfare policy and government body in charge of it. “To push for the reforms, a team currently in charge of animal welfare under the Agriculture Ministry should be expanded so that it can effectively improve animal welfare standards in the face of the livestock industry’s pursuit of their own interests,” they said. The government has received criticism for its poor response to the egg contamination scare — including its failure to carry out a thorough inspection and lack of coordination among relevant government bodies. President Moon Jae-in apologized Monday over the scandal, vowing measures to improve the livestock farming environment. “In the wake of this case, we have to examine the entire livestock industry’s safety control system and promptly craft measures that can be trusted by citizens,” Moon said at a Cabinet meeting..
#Private_clinic’s_usage_in_scandal ##cha_hospital_alleged_of_favor #SNUH_also_alleged #Korea’s_President_Park_Scandal #What_about_MoH_itself? The Ministry of Health and Welfare on Friday began investigations into two clinics which have been allegedly linked to President Park Geun-hye’s scandal-ridden confidant Choi Soon-sil and also involved in suspicions about treatments for Park. The ministry ordered the Gangnam Public Health Center to conduct inspections of the Gangnam-based Kim Young-jae Plastic Surgery Clinic and the anti-aging clinic Chaum, which are affiliated with the Cha Medical Group. Both clinics are known to have been frequented by Choi and members of her family since 2010. The latest allegations are that Choi and her secretary were prescribed medications on behalf of the President. Park is also known to have visited the clinic as a lawmaker before becoming President. The medications have been reported as fatigue-relieving vitamin shots. Prescribing medications to someone else on behalf of a patient is allowed only rarely. The clinic denied the proxy prescription, saying the medications were for Choi, not Park. But a source at the hospital told local broadcaster JTBC that Choi wrote “Cheong Wa Dae” when she got the prescriptions. There are suspicions that a doctor who was taking care of Choi at Chaum, surnamed Kim, was granted favors because he became one of the President’s medical advisors at the beginning of her term in 2013. It is also alleged that the medical group benefited from the government: it was included in the economic delegations when the President visited China and Iran in 2015 and 2016. In addition, Cha Hospital was selected as a ministry hospital in charge of research, and received 19.2 billion won in funding. The hospital denied the allegations about favors. Kim, who left the hospital in 2014, reportedly said he did not know about Choi’s influence. The Kim Young-jae Plastic Surgery Clinic was also frequented by Choi and her daughter Chung Yoo-ra. The director surnamed Kim, who was a general practitioner and not a specialist, was appointed by Seoul National University Hospital (SNUH) as a doctor for outpatient care, raising suspicions that he was granted the favor based on his acquaintance with Choi. SNUH President Suh Chang-suk said Kim was appointed because a wealthy patient from China wanted treatment from Kim, but said he was dismissed as the patient did not come. Suh served as the President’s doctor from September 2014 to February this year. Kim was made an outpatient doctor two months after Suh was appointed. SNUH also supplied the thread used in Kim’s facelift procedures at its cosmetics surgery division. Kim followed President Park on her overseas trips, as an executive of a medical appliances company owned by his wife. Kim’s brother-in-law had the chance to promote his cosmetics company’s products on the President’s visit to France. Products of this company were provided as Park’s gifts for the Seollal holiday this year. However, Suh said he did not know Choi. Meanwhile, there have been rumors that the President, whose whereabouts for seven hours right after the Sewol ferry disaster on April 16, 2014, remain unclear, was receiving a procedure at Kim’s clinic. The clinic denied that Kim performed the surgery, claiming he was out playing golf at the time. Cheong Wa Dae also officially denied the suspicion. SEOUL—Prosecutors have indicted a former chief executive of the South Korean unit of Novartis and five other former and current managers over allegations they illegally paid doctors 2.6 billion won ($2.3 million) in return for prescribing the company’s drugs. 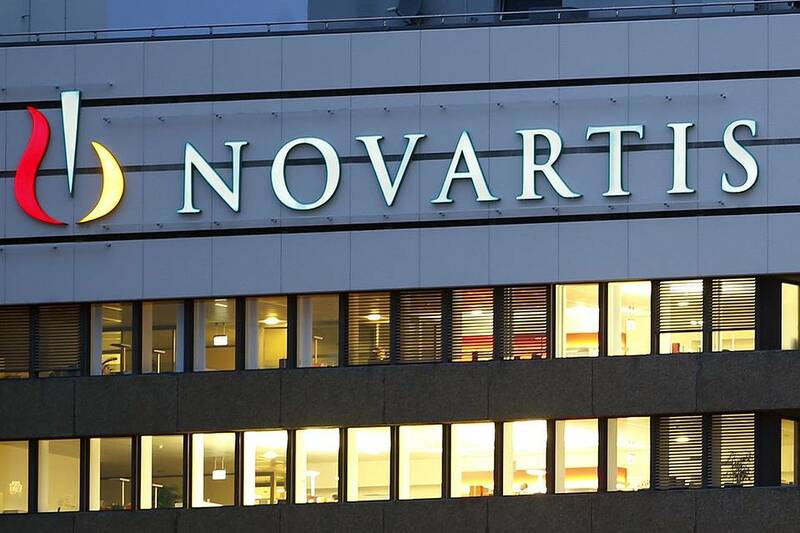 In response, the Swiss pharmaceutical company expressed regret through a statement, but said such conduct wouldn’t have been sanctioned by the “most senior management” at Novartis Korea. “Novartis does not tolerate misconduct and we are already implementing a remediation plan in Korea based on the findings from our own investigation,” the Basel-based company said. Paul Barrett, an official from Novartis International, said the company could provide no further detail on the case before the trial proceedings. The executives indicted include former Novartis Korea chief executive Moon Hak-sun, according to prosecutors. Mr. Barrett said Mr. Moon had agreed to take a temporary leave of absence in April. Novartis did not identify the other former and current executives charged and did not provide any contact details for Mr. Moon or his attorney. The Seoul Western District Prosecutors’ Office said it also indicted 28 others, including 15 doctors and six publishers of medical journals, over their suspected involvement in transactions that took place between 2011 and January this year. None of the suspects has been arrested. South Korean laws ban drug companies from providing doctors rebates or discounts for the drugs they prescribe. When did the medical institutions become “industry” to go abroad? And who is these experts? State health agencies said Friday they have launched a group of specialists to effectively assist South Korea’s medical institutions get established in foreign countries. The Ministry of Health and Welfare and the Korea Health industry Development Institute (KHIDI) are working together in operating the “Global Healthcare Key Opinion Leaders” (GHKOL) and has selected 47 members for the group that will provide consultations on legal, commercial and financial matters specific to individual countries, officials said. The members, formally appointed on Friday, organized a session on China on the same day, briefing the participants on strategies and the latest trends in China’s health care industry. Institutions planning to expand overseas can apply for the group’s assistance, and consulting fees will be paid for by KHIDI. Oxy Reckitt Benckiser, whose humidifier sterilizers caused harm to the most number of victims, officially apologized five years after the incident first broke out. They explained that the apology was delayed because they tried to provide sufficient compensation measures, but they failed to present any specific plans to compensate the victims. The company will have a hard time avoiding criticism that their latest apology was rushed to resolve the situation as prosecutors launch an investigation into the incident and more and more consumers join in a boycott of their products. 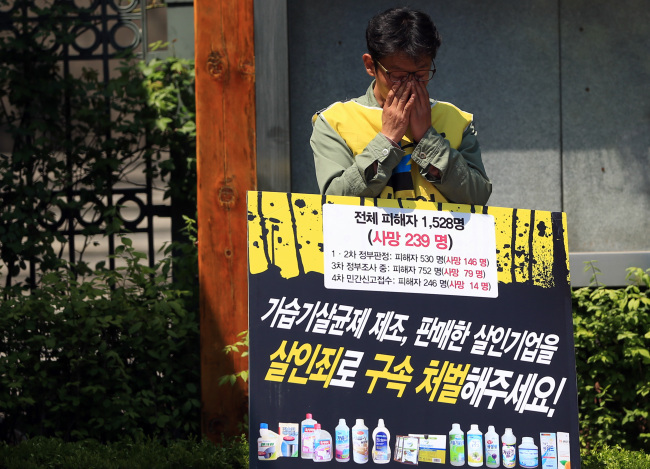 Atar Safdal, head of Oxy Reckitt Benckiser Korea (currently, RB Korea) held a press conference at the Conrad Hotel in Yeouido, Seoul on May 2 and said, “We bow our heads and apologize to all the victims and their families who suffered lung damage due to the humidifier sterilizer. We fully realize our responsibility in failing to promptly provide appropriate measures.” According to the prosecutors, 177 people including 70 dead suffered damages from using an Oxy product. 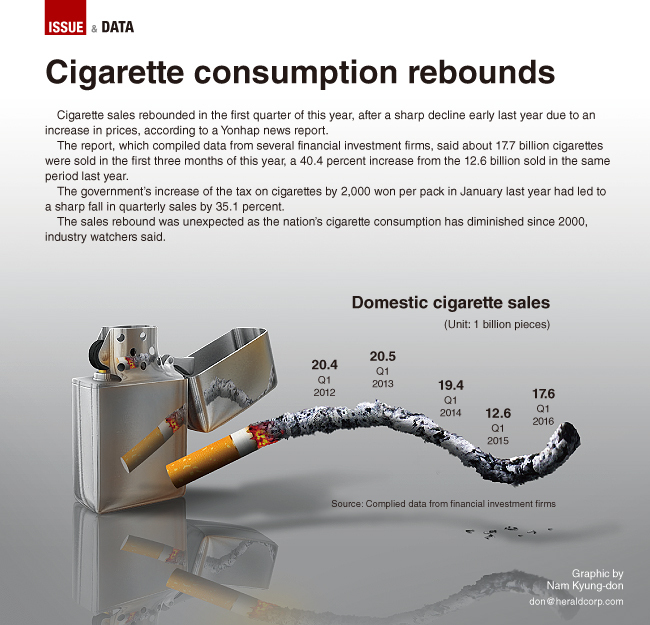 From 2004 to 2010, over 2.2 million Oxy humidifier sterilizers were sold.